Make it a party wherever you go, with this portable Party Mirror Ball! This multi functioning party ball has 4-red, 4-green, 4-blue, and 6-white LED lights on the base for jam-packed disco action! Party Mirror Ball also includes two functions so your party never gets boring! First function will have your party ball lights flashing to the sound of your music, the crowd, or any sound you like, all while the ball is rotating! The second function will allow the ball to rotate while the lights stay on! The light and compact design enables more locations for operation. 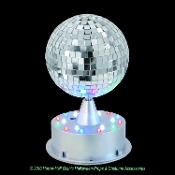 Includes real glass mirrors on 5.2-inch diameter ball, metal spinning rod on a grey plastic base, 4-holes on plastic base to screw mount item upside down on ceiling or wherever you like, and a plastic fold out hanger if you want to display the Party Mirror Ball upside down! The mirror ball rotates around its own axis at approximately 12 RPM and is illuminated from the 18 LEDs. Approx 6-inch long x 6-inch wide x 9.5-inch tall (15x15x23.75cm). Glass facets 8 x 8mm. Prop requires 3-AA batteries (NOT included) .08 Watts per light. Warning: mirrors are made from real glass, sharp edges. Not a child’s toy. A must for every wild and crazy party!